As a big Killing Floor game series fan, I was fiddling a lot with its engine and found out quite some really nice tweaks and settings as well as designed few of my own. 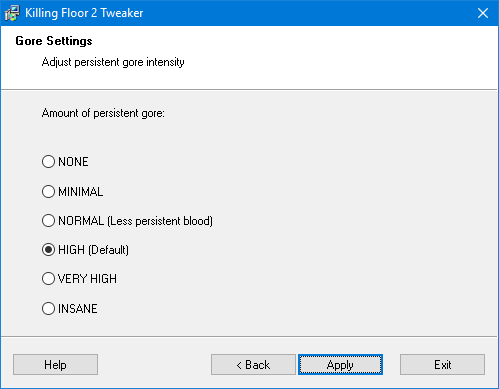 Since fiddling with INI files isn’t always the easiest way, I’ve made a simple GUI driven tweaker for Killing Floor 2. 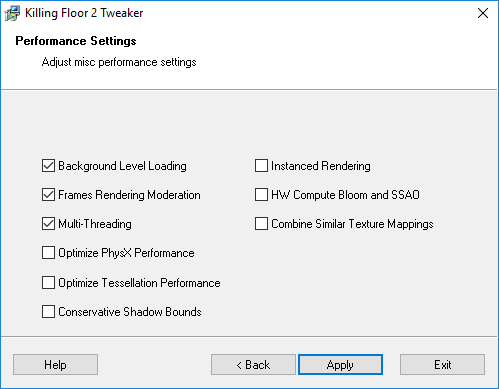 If you are experiencing any technical (like crashing), graphics or performance issues, please perform “RESTORE DEFAULTS” to see if it makes any difference before contacting Tripwire Interactive (Killing Floor 2 developers). I don’t want to create them additional work because some tweak interfered with the game itself. If problem persists even after restoring default settings, then contact them for technical support. Thank you. 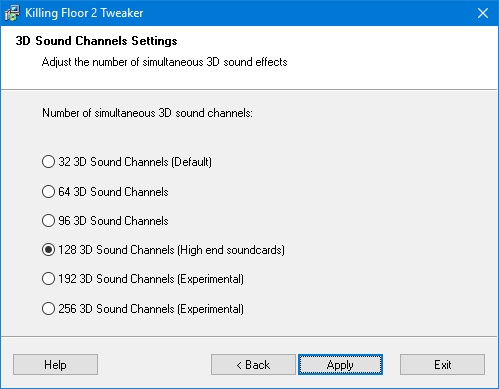 Automatically detects Killing Floor 2 settings files. Fully portable! Easy to use with descriptions and ability to restore tweaks to default settings in just few clicks. No more messed up INI settings! Added “Extreme Draw Distance” tweak. Descriptions for each new setting can be found inside KF2 Tweaker by clicking “Help” button in lower left corner of each settings panel. Total Settings Reset feature does NOT reset achievements or perk progress! Very High and Insane gore presets now only increase amount of corpses and gibs, but not blood. It looks better this way. Due to gore presets changes, I recommend re-applying a desired gore preset to apply new changes from this build. Tripwire, why the hell did you block all this!? Self-Shadowing and MLAA wasn’t causing any problems! Renamed “Efficient Multi-Threading” to “Multi-Threading” and updated description for it.